I am an elementary teacher, teaching various classes from kindergarten to fifth grade. Five years ago I started a Wellness Committee, where we have embarked on a journey to create a better and healthier school-wide food culture. Since then I have also created a wellness educational program, where I try to bring food alive in the classroom, but at times struggle with materials and resources. I teach in a high-needs neighborhood, and it is hard not only to get the message across, but also actual food as well. There are not very many places to find fresh food, and most of the students qualify for free or reduced lunch. I have great support from my school leadership, teachers, and families about the work and new initiatives, which has helped to make for a positive work environment committed to the well being of our students. Over the years I have implemented a healthy snack food policy; promoted the salad bar daily; wrote and got a grant for a water cooler at lunch every day; brought weekly plant-based food into the lunchroom; partnered with the NYC Department of Health and Veggiecation; got a grant for daily fresh fruit and vegetables for all pre-K-5 students; and worked to educate, advocate, and promote the various programs and partnerships we are trying to sustain. I am focusing on my fourth and fifth grades using the Nourish curriculum. We are starting to develop our own food stories and track our food using resources such as Global Grocer (by Food and Water Watch) and HarvestMark (an app for tracking food packages). Global Grocer has been a great tool for students to visualize how the choices they make have great impacts. I am also using the Nourish video clips to engage and focus the students on the key messages. 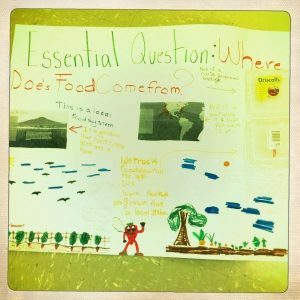 The printables from the Nourish curriculum are excellent tools for the students to gather information and organize their data and findings as they work to investigate the essential questions and food systems. Essential Question: Where does our food come from? Students used my iPhone to track the barcodes on certain fruit packages to see where they were coming from and then decided whether it came from local or industrial food systems. Students had to make decisions by investigating and researching on HarvestMark, along with the Nourish curriculum and video resources, to determine what kind of food system they were eating from. Such rich conversations emerged! The invitation to “Vote with Your Fork” really resonated with some of my students. Students are becoming more aware about where our food comes from and how it impacts our bodies and world. Students have realized that they do have choices and that they can be part of this movement to advocate for good food. When students see where in the world their food is coming from and trace a path from one country back to New York City, they can visualize food miles and begin to think differently and have conversations about food with their friends and families. Students have begun to talk about where food comes from on a more global level than just “the supermarket” or “a farm.” One discussion in particular was about a picture of a food system with an outdoor roof type of covering. One student said this must be an industrial food system because there was a building, and it must be a factory. The class was quiet and then one student said, “No that is not a factory, it is a roof over a stand, probably to protect from the rain. This is definitely a local food system.” She pointed out components of a local food system to her classmates. This was a memorable moment for me as a teacher, where I saw students taking part in higher level thinking and inquiry work into food systems and sustainability.